LONDON, UK, January 2, 2014 (ENS) – Thousands of pieces of plastic have been discovered submerged along the river bed of the upper Thames Estuary by scientists at Royal Holloway, University of London and the Natural History Museum. Flowing through the city of London, the 346 km (215 mile) long River Thames is often considered clean, with pollution a thing of the past. Rising at Thames Head in Gloucestershire, the Thames flows into the North Sea via the Thames Estuary. On its way, the river drains the whole of Greater London. But the authors of a new study on the plastic beneath the Thames say the amount of plastic recovered shows there is an unseen stream of rubbish flowing through London which could be a serious threat to aquatic wildlife. Their findings, published online in “Marine Pollution Bulletin,” highlight the cause for concern, not only for ecosystems around the river but for the North Sea. Although contamination of marine ecosystems by plastics is becoming recognized as a serious pollution problem, there have been few studies that demonstrate the contribution made by freshwater catchments. 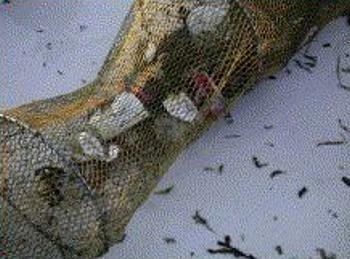 Using nets designed to catch invasive crustaceans called Chinese mitten crabs, Royal Holloway and the Natural History Museum scientists documented rubbish collected during a three-month trial from September to December 2012. At seven localities in the upper Thames estuary, submerged plastic items were intercepted in eel fyke nets anchored to the river bed. More than 8,400 pieces of plastic were collected, including large numbers of cigarette packages, food wrappers and cups, but more than a fifth of the waste was made up of sanitary products. “This underwater litter must be taken into account when predicting the amount of pollution entering our rivers and seas, not just those items that we can see at the surface and washed up on shore,” said Morritt. “The potential impacts this could have for wildlife are far reaching. Not only are the species that live in and around the river affected, but also those in seas that rivers feed into,” he said. Most contaminated sites were in the vicinity of sewage treatment works. 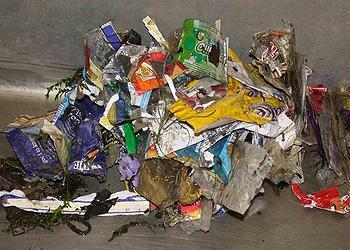 The waste collected for the study is only a small snapshot of the volume of litter that may exist at the bottom of the Thames. Plastic bags and other large items are unlikely to get caught in the small nets, so the true extent of the problem is still unknown, the researchers said. Cormorants, gulls and mute swans, Canada geese, Egyptian geese, bar-headed geese and ducks inhabit the river along with great crested grebes, coots, moorhens, herons and kingfishers. Many types of British birds also live alongside the river, although they are not specific to the river habitat. The eel is associated with the Thames and freshwater fish of the Thames and its tributaries include brown trout, chub, dace, roach, barbel, perch, pike and flounder. Salmon have been reintroduced. The population of grey and harbor seals numbers up to 700 in the Thames Estuary. Bottlenose dolphins and harbor porpoises are also sighted in the Thames. “Plastic can have a damaging impact on underwater life. Large pieces can trap animals but smaller pieces can be inadvertently eaten,” said Clark. Scientists are pressing for changes to both policy and consumer behaviors, as the dangers of plastics become more apparent. To highlight the issue of marine litter, the Natural History Museum is hosting a Plastic Awareness Weekend on January 4–5.